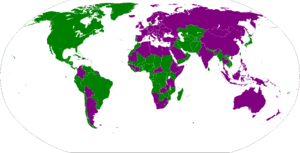 Sometimes maps and charts can help the remembering of gender names for countries, as this one for French, for example. You can do similar things for months of the year, etc. There's no reason why drawing a map on one double page of a Goldlist book and retracing it shouldn't be a nice break from the usual modalities of Goldlisting. I just thought I’d write a bit about your Goldlist method while I’ve got a few spare minutes. I have just started using it and wonder what your thoughts are on a few issues I have. I had, by chance really, happened upon my own method of learning vocab but without really thinking much about the function or structure . Like yourself I had an instant aversion to the standard mnemonic memory tricks, thinking that I just didn’t need all of that extra baggage to learn simple words. I also didn’t get on with flashcards very well. Since I was getting all of my vocab from reading literature I was looking up a lot of words in order to simply follow the story. This was time consuming and I would frequently realise that I had already looked up a certain word, sometimes several times already, only at the point of once again looking it up. This all changed when I purchased a brilliant dictionary for my Iphone which had a ‘favourites’ folder where you could bookmark words for learning later. However I found that I didn’t ‘learn them later’- I simply looked them up again and again. It was much quicker to type half a word than search through the pages of a dictionary and it would also tell me if I had that word already in my favourites list. After about a month or so, I would go through the list of favourites and delete the ones I definitely knew. So, depending on how common the word was, I was, by default almost, using a spaced repetition system, though I knew nothing of this type of system at that time. I found that I was learning the words without trying, just by reading them. And it won’t surprise you to learn that some words would ‘stick’ first time and others took many ‘passes’. There are obviously problems with this rather disorganised method , for instance the slow rate of vocabulary acquisition and the limited source of the vocabulary to name but two. So when I found out about your goldlist system I immediately thought of the similarities to what I was doing and thought that it could definitely be an improvement. I agree with you about our relationship with the subconscious long-term memory and that explains why words can simply ’appear’ into my vocabulary without me remembering even remembering having heard them – if that makes sense. My subconscious has ‘sampled’ them from a radio program or somewhere without me realising. I also see the same process occurring with my kids who can grab the strangest words and phrases from seemingly nowhere. If I still get most of my vocabulary from reading literature then I cannot avoid coming across a certain amount of the words again, by accident, before its time to distil, simply by looking them up whilst trying to follow the story. I would be inclined not to worry about that unduly. These are probably the words which are coming up so often that in the grander scheme of things you won’t get too far in the language without automatically knowing them very well anyway. I sometimes find that I am very familiar with the word itself but have trouble remembering the translation. This can be exacerbated when I look again at the headlist and remember the word itself very well but not necessarily the meaning. I have ‘sampled’ the word but not the meaning. You could find it useful just briefly to think about the object or activity or idea of the word while saying it aloud, but don’t repeat it or drill it or construct contrived mnemonics. Just the way you woul have done it for yourself as a child when you met a new word you had some kind of image in your head that it got associated with, and that has stood you in good stead till today even though it might have been a very childish image or a very idiosyncratic, personalised image. I don’t yet find it easy to remember the genders of words using this method. The genders of nouns (which are the words carrying implicit genders, not all words do so) can be learned best by applying general rules to them. For most languages that have gender, there are rules that enable you to predict the gender of most words. A clear example are languages like Italian, Russian, Czech, Spanish, where if a noun ends in “-” then by default it’s feminine unless there’s a reason. Beyond that there is what you might call ‘natural gender‘ – nouns talking about men are usually masculine even if they have an ending that looks feminine. The next thing is etymological gender. In Spanish you will find that a lot of words ending in -ma are el and not la because Castillian likes to reflect the classic origin of its vocabulary, and in Greek nouns like sistema and problema were neuter and so they are subsumed as in most of the vulgar Latin fall-out languages into the masculine. If you look carefully at most languages with genders, rules giving the gender from the structure of the noun cover from 30 to 90% of cases. If you are learning a language with 90% then you are nearly home and dry, but for 30% ones you have to rely more on the natural gender clues and the etymology. They are least will help you make sense of it. Taking for an example three feminine nouns in German, Leidenschaft, Mutter and Jugend, we have an example of each kind I am talking about. Leidenschaft you learn as feminine because there is a rule that any book worth its salt should be telling you and that is that all the words ending in -schaft, heit, taet, keit and several others are feminine. So that is structural gender. Die Mutter has no structural gender, it ends in -er like Vater but it has a clear natural gender. You would automatically say “she” for mother in English. Maedchen (girl) you would say ‘she’ for in English too, but in German it remains “es” because the structural gender of -chen is stronger than natural gender, and neutral gender in German doesn’t carry to quite the extent as in English the dehumanizing effect when applied to people. It simply carries a desexualising effect. But why “die Jugend”? It doesn’t look like a feminine word, there is no real reason why youth should be seen as feminine, but it is down to the etymology. Assuming we don’t want to look at OHG and Gothic and try to reconstruct a version of “jugend” in which the gender is more visible, we can simply learn “die Jugend” as an exception and always Goldlist it with the appropriate der/die/das form (which you wouldn’t have to with more obvious cases), but it we do start to scratch the matter using Wiktionary or some other etymological sources we see that it goes back to “jugunth” in West Germanic and “geogiuth” (pronounced “yoyouth”, becoming later “youth”) in Anglo-Saxon. How does this help, you may well ask. Well, consider a common ancestor of ‘geogiuth’ and ‘jugunth’ and you might see something that could also be related to the French “jeunesse” which is structurally feminine. So going down the etymological road can help! Simply asking yourself “why might this word be the gender it is” can do a lot to help you remember, even if all you do is speculate for two seconds. Glossing over it entirely as you Goldlist may not be as helpful, but trying to rote learn genders by senseless on the spot repetition is even less helpful. My active vocabulary can only be increased by ‘needing’ to say a word and I still may need to look it up to do this. Therefore, have I really learned the word if I can only recognise it whilst reading? In fact yes, as you will always slip back into not having words on the tip of your tongue and the reactivation perio is three days of immersion only, whereas language learners waste time on this Holy Grail of imagined fluency and it prevents them building up a larger vocabulary base in the language. There is nothing wrong with being able to follow a written text and spoken text without losing the drift. If you can do this then you are fluent and the difference between this latent fluency and active fluency is being there in an immersed situation for three days. The brain by that time switches on the whole synapse set you need to be finding the words you actually know at speech speed, and the fact you understand them when someone else says them – and would know if they were using those words wrongly or saying them wrongly if it were for example another learner – means you do know the word and ought to relax on that score. Language schools make a lot of money by the way out of cultivating the learner’s expectation that they will be able to do the performing seal act in a language at the drop of a hat. That’s how they pad out a small amount of course material in class over a longer time, and take years and years of your money to do what can be done on your own and in months not years. I don’t see these questions as problems as such since my goal is increasing the speed of my vocabulary acquisition and that is already working. It was just to find out what you think. Well, the above is what I think. What do you think of what I think? Also as a separate question: How would you define being fluent in a language.? At what level do you consider yourself fluent? Or is this question relevant at all anyway. I only ask this last question because it’s one I am asked a lot and cannot usually give people a satisfactory answer. I feel it’s a distraction at best. It’s easy to tell when someone is fluent and just as easy to say when someone isn’t. As for the in between? I think that ‘fluency’ is a funny concept when you really get down to it. Let’s imagine someone who likes to say very little even in his own language, but reads a lot and listens a lot. He understands everything but like the wise old owl in the nursery rhyme, “the more he heard, the less he spoke”. Someone else , let’s say his brother, talks nineteen to the dozen and can speak about 200 words a minute and will if you let him, but doesn’t actually know half the words or understand half the concepts of his silent brother. Who in this case is the more “fluent”? Why, according to the standard definitions of fluency, it is the one who can talk and not let anyone else get a word in edgeways. He is so fluent he is superfluent, and one might even say effluent! But who has the more useful knowledge of language? Who can use the language to get at deeper concepts? Who, when it comes to sitting back and writing three lines that express perfectly what they mean, will prove the more competent in their language? And there are many mileposts. For the missionary, he is not fluent until he can pray in the language of the people to whom he is sent. The accountant working in a foreign country is not fluent until he has mastered the technical terms, but may still prefer to address God in his native tongue, that is, that of the learner, as we don’t know for sure if even Adam spoke the Divine language, if there is one. The mileposts should be set as individual KPIs for the individual learner, and one of them is the individual learner’s definition of fluency. We shouldn’t set “fluency” in a language as meaning to be able to talk for half an hour for somebody who like the taciturn brother above has no inclination to sound off like that even in his native language. For the other brother, who wants to be able to talk like that, then for him the definition of fluency might well be that he can get the same points over and with the same style and persuasion, or lack of it, as he has in his native language. Their individual definitions of fluency are determined by their individual need profiles and the applications of language that they are likely to encounter. Given the above, decide what fluency is for you, you’re welcome to share that here, and for you that becomes the goal, if fluency is your goal. Don’t call fluency in German being able to do the Frankfurter Allgemeiner crossword in ten minutes if you can’t do your own paper’s crossword in ten minutes, though, because that is asking for more than equivalent functionality in the new language than you used in the native one, and that’s not a fair definition of fluency in language. That doesn’t make it an invalid goal, it is just something other than pure language acquisition. And please don’t confuse the performing seal act you tend to see done by YouTube polyglots as necessarily genuine linguistic fluency. You don’t know if they’ve memorised a text or not. Many thanks for some excellent considerations! Eat thankfully – your food will taste better that way. Victor asked to see some of the goldlisting of the Heisig book recently described in practice. I picked a relatively early point in the book to show – this is the 10% mark – and please note in this particular book the headlist is on the right and the first distillation on the left. No frames were actually distilled out on this page but you can see the stories getting shorter.